This morning I heard a firm knock on my front door. It woke me up immediately and a sweet sense of excitement bloomed in my heart. 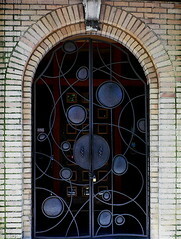 With my hair still ruffled and my eyes swollen from a good night’s rest I rushed to the front door, unlocked it and swung it wide open. A gentle morning breeze caressed my face and I smiled from ear to ear as I set sight on my visitors: several swirling energetic colors, some fine spun yarn, a croaking toad, a honeybee, some rays of sunlight, laughing fuchsias, timid pansies, a pair of bamboo needles, written words, embracing light tones of music, secrets of life, deep conversation, giggling forest fairies, a sea of Love and… and… and so much more sweetness gracing my front porch. “WHERE HAVE YOU BEEN?!? !”, I cry out. Knit 4, bring yarn to front of work in one gracious movement, purl 4, bring yarn to back of work in another gracious movement. Repeat 4 times more, turn work, feel the yarn while it caresses your fingers. 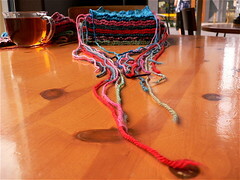 Now start with purl 4, bring yarn to back of your work, don’t forget to be gracious in your movement, knit 4. And repeat 4 more times… Over and over and over again, row after row. 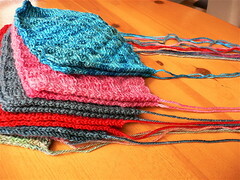 Slip slip knits, yarnovers, knit two togethers, knit three togethers, wrap and turns are all not present. It is just me, the yarn, the needles and the two most basic stitches of all stitches; Knit and Purl. We are happy and satisfied in the soothing drone of Monotone Simplicity. One little square after another is completed with so many different dk and very light worsted yarns: Rowan cashsoft, Artyarns Supermerino, Lonesome Stone Mountain Feat, Lonesome Stone 100% Alpaca, Araucania, Colinette, Misti Alpaca and Mountain colors. 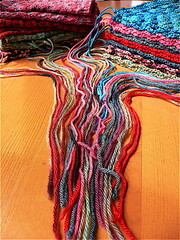 The stack of little squares is getting higher and higer, the strands of yarn form a colorful streaming river. Now if you all excuse me. I have a mountain to seam. This entry was posted on Thursday, July 19th, 2007 at 2:39 pm and is filed under Knitting. You can follow any responses to this entry through the RSS 2.0 feed. Both comments and pings are currently closed. 5 Responses to Where have you been..? I feel more sorry for you with all the ends…whoo, boy. I love how vibrant these blocks look…are you going to seam them up randomly or arrange them according to the colors? I so love to read your poetic writing.